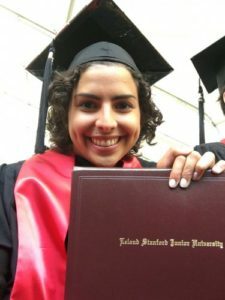 Estefania Ortiz - Galactic Unite Brightman STEM Scholarship Recipient Graduates from Stanford! Four years ago, Estefania was the recipient of the Galactic Unite Brightman STEM Scholarship! Sarah couldn’t be more proud of her in achieving her Bachelor of Science in Computer Science! Congratulations Estefania Ortiz!!! The Brightman STEM Scholarship Program helps young females in the US pursue STEM education throughout their four-year college career, providing a much needed boost to the current participation of females in this area.